Hello! I am Venetia from Atomic Venetia. I am from the beautiful Pacific Northwest, where I enjoy crisp grey days with coffee, and warm evenings in front of the fire with my family. My whole life I have created objects and art across many media. I am incredibly happy to be sharing some projects I made with the gorgeous collection from Authentique, Natural. As soon as I saw this collection I was in love, and the collection pairs well with both warm and cool neutrals. It was a breeze to make projects perfect for host gifts for upcoming fall and winter celebrations. My first project is a mixed media canvas. The patterns in Natural are a beautiful mix. This collection’s colors feel rich and bright. Canvases are one of my favorite projects because they are a fun way to mix techniques and media. I also like being able to add a sentiment intended for the recipeint. For this sentiment, I mimicked the design of the stickers in the Natural collecton pack. On the canvas, I mixed basic punches with Silhouette cuts. 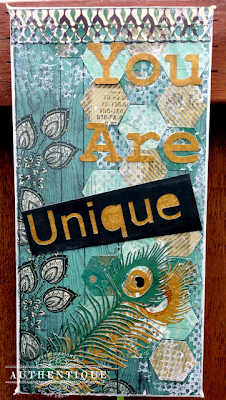 To add depth, I distressed with ink, added texture with gesso, and added a pop of sparkle with glitter glue. I also created a pomander. I am so in love with how this collection pairs with gold, which reminds me of fall. I built stackable flowers with a mix of Silhouette cuts, hand cuts, and punches. 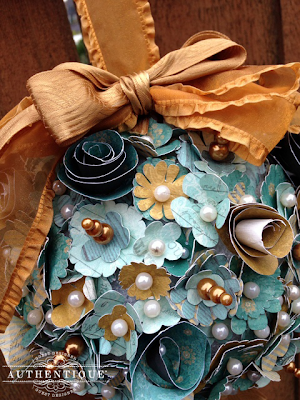 I used a foam ball as a base, and used gold and pearl floral pins to place the flowers around the ball. Authentique papers have long been my favorite for paper floral designs because they are a heavy weight, allows for the manipulation of the floral to build dimension and texture. 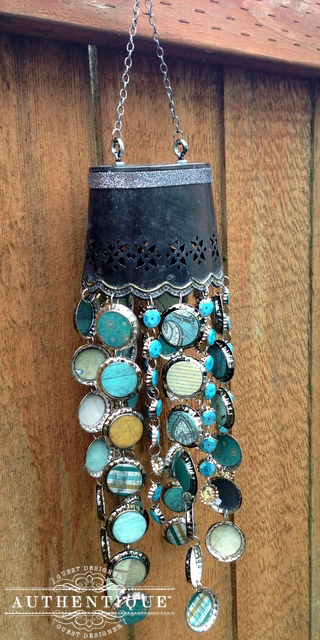 For my final project, I created a wind chime. This time, I paired the collection with silver and black neutrals. 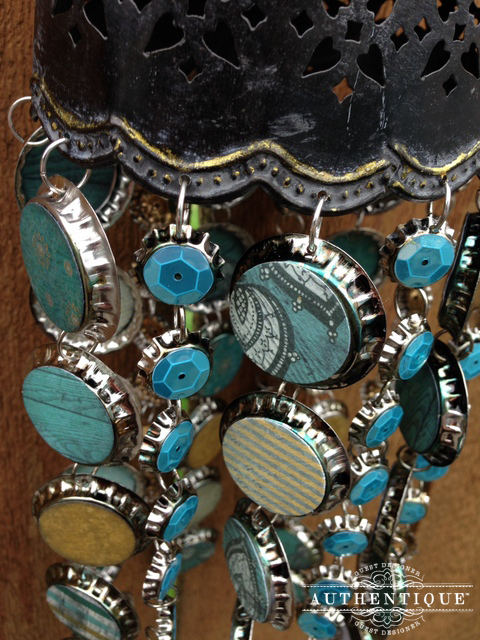 I knew that Natural would pair perfectly with the aluminum pot when I found it, and I remembered a pin on Pinterest of a wind chime using recycled materials. I decided to adapt the pin into an altered project. To create this, I punched circles from the papers in Natural. 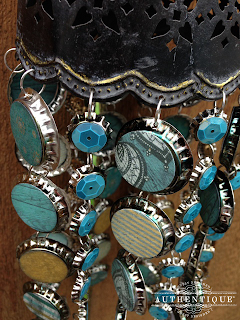 Then, I decoupaged the papers and sequins onto the bottle caps. I used some alcohol ink to distress the caps, and used a metal punch to create the holes. I connected the pieces together, and then added some sparkle to the pot with some ink and glitter ribbon. To hang the pot, I drilled two holes, and placed two eye screw and nut sets through the holes. I then used a chain to create a hanger. I am so grateful to share my love of Authentique with all of you, and hope you found some inspiration from my projects. Thank you! 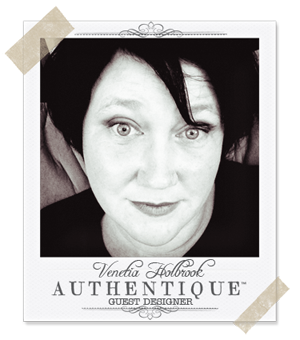 Be sure to stop by Venetia's personal blog and say hello, and please let her know we sent you! Oh my goodness Venetia! I LOVE all of these projects! Thanks for the mini tutorial for each one - I want to try them all! Thanks Authentique for bringing another fabulous designer to my attention! I am a huge fan of all things Authentique and this post is just full of inspiration!! A gorgeous collection of projects from a very talented artist! Wonderful work Venetia! Thank you Authentique for the chance to show off this gorgeous collection! I cannot tell you enough how much I love these colors! What a fab use of that paper! Oh my goodness! Such beautiful projects! Wow, greatly fabulous stuff, Venetia! Love what you've done with Authentique! I saw a tree made with the little flowers - like the ball in this post. I cut the flowers out of various shades of white and light blue and decorated them for my granddaughter's wedding. I had three sizes of Styrofoam trees, set them on a mirror, decorated with ribbons the color of the dress, and she used them for the table with her guest book. She loved them. 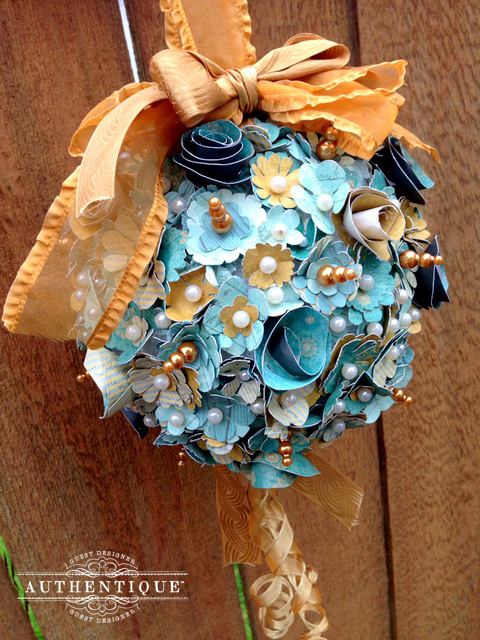 I just love this collection anyway, so anything made with it I love, but your wind chime and the pomander are something I would never think to make and they are super cute! Really cool ideas!